According to the Harvard Business School, at least 75% of all start-ups fail. Yet failure is integral to the success of those that survive. Can banking accept the risk of failure and support potentially disruptive innovation? Increasing consumer expectations, the influx of fintech competitors and the reduction in margins are forcing banks to rethink their current business models and sources of revenue. Although innovation is a proven path to differentiation and competitiveness, the banking industry’s short-term focus, siloed approach to operations and risk-averse culture work against the potential for meaningful advancements. While traditional banking organizations have lagged other industries with regard to innovative cultures, the challenges seem more deeply entrenched in the U.S. Evidence of this dearth of exciting innovations by banks in the U.S. is found as banking innovation awards finalists are announced by BAI-Infosys and Efma-Accenture – with very limited representation by traditional U.S. financial organizations. The question is whether banking can replicate the best of fintech start-ups, while leveraging their customer base scale advantage to respond to a changing marketplace? Or, will the majority of the industry need to be fast-followers… or laggards, with the inherent risks? Building an ‘culture of innovation’ is most likely at the top of most banking organization’s corporate agendas. There is no denying that a firm’s own employees are uniquely positioned to understand both their customers and their own organization. Unfortunately, while many organizations say they are increasing their efforts to build a work environment that inspires innovation and creativity, research indicates that many corporations may have a surplus of ideas that aren’t being nurtured. Worse yet, a risk-averse approach to innovation is creating incremental improvements rather than the level of innovation needed to generate meaningful ROI. Finally, the structure of banking makes the entire process too slow, resulting in lost revenues. In a research report from Accenture entitled, Corporate Innovation Is Within Reach: Nurturing and Enabling an Entrepreneurial Culture, nearly half the employees (49%) said management support was very important to the generation of entrepreneurial ideas, while only 20% believed their company delivered it. And although 42% considered tolerance of failure from management as very important, only 12% thought their company was good at doing so. 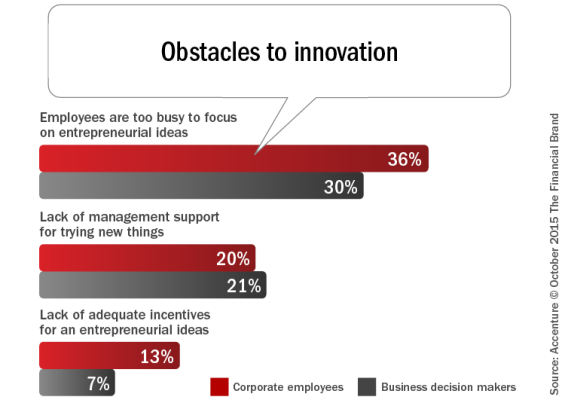 When asked what the biggest barrier to entrepreneurialism was at their organization, approximately one-third (36%) believed their job keeps them too busy to pursue new ideas,with 20% saying it’s the lack of management support for trying new things, and 13% saying their company does not provide incentives or other monetary compensation for generating successful ideas. 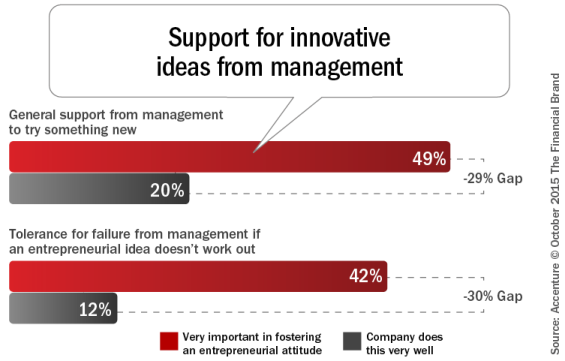 Finally, three in four (77%) said that new ideas are rewarded only when they are implemented and proven to work. As a result, more than 27% had avoided pursuing an idea with their company for fear of ‘negative consequences’. Put the Customer First: Innovative organizations use all tools available to understand their customer’s needs and behaviors. They invest in capturing insights from internal and external data sources and build models to enable contextual decision making and communication. This understanding of the consumer also drives product development and digital design. Integration of Innovation Strategies with Business Objectives: Not all innovation investments are prudent. The most successful financial institutions invest in innovations that are consistent with overarching business strategies. This includes establishing clear ownership and accountability for results. Establish an Innovation Culture: Without top-level management support for innovation, risk-taking, networking and collaboration (including a meaningful measurement and rewards structure), it is difficult for an organization to achieve the spirit or success of smaller and more agile fintech firms. Empower champions that are able to push back against naysayers. Embrace Internal and External Collaboration: The most successful innovators take advantage of new ideas both inside and outside the organization. In fact, it is becoming more commonplace for innovation labs to be built within banks while at the same time making investments in new fintech firms outside of traditional banking. Provide a Structured and Disciplined Environment: To be effective, innovation process must run quickly and efficiently and need to be separated from the normal banking silo structure that slows the process. According to Accenture, “To generate real value, an idea needs to pass through the four filters of the innovation funnel: initial review, feasibility review, capability review and execution.” There must also be a redefinition of metrics and incentives that may seem to run counter to traditional performance metrics. Focus on Speed to Market: Swift execution of innovative ideas is imperative to maximize ROI. “Successful organizations aren’t constrained by customary ways of doing things, they remove the words ‘no’ and ‘cannot’ from their vocabularies, and instead focus on finding a way to succeed,” according to Accenture. They also utilize small, focused project teams. Put Technology Front and Center: Give your teams the tools to succeed. Investing in flexible and agile technologies allows financial organizations to adapt quickly, increase speed to market with new business models and reduce overall IT costs. The key is to fail fast and fail cheap. Assess the innovation culture and process within the organization to determine if new ideas are encouraged and rewarded. Determine how innovation can be integrated and aligned within the overall business strategy of the organization through innovation roadmaps, measurement processes and a rewards structure. Publicize the innovation culture within (and outside) the organization. Make sure this culture begins at the very top of the organization. Create opportunities and incentives for innovation and idea development. The banking industry is faced with the risk of disruption from many known and unknown sources. How organizations respond is critical to continued success and ultimately, their existence. This article was originally published on October 12, 2015 . All content © 2019 by The Financial Brand and may not be reproduced by any means without permission.